Is my house suitable for a loft conversion? Converting your loft is the less traditional, but ever popular way, of adding space and value to your home, working from the top down. When thinking about converting the loft space in your home, the most important factor to consider is your existing loft structure. This type of roof is found in houses that were built before 1965. They are different from modern roofs as their rafters form an M shape that meets in the middle of your loft, and typically have a measurement of 2.2 metres at their highest point. These roofs are usually found in homes that were built post 1965. These styles are constructed with the rafters forming a W shape, and are typically 2.4 metres at their highest point. Trussed roofs can be more difficult to convert than traditional roofs. 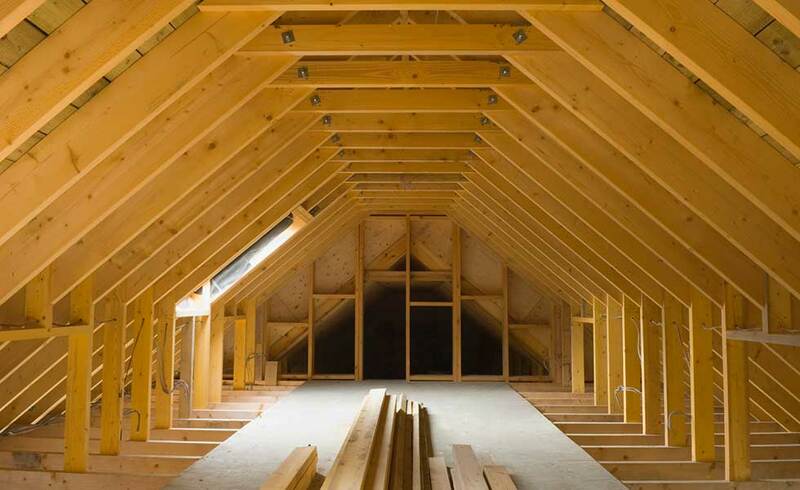 The problem with trussed roofs is that, because of their W shape, the frame generally takes up most of the room in the loft, meaning the entire frame must be replaced. However, this endeavour is by no means impossible - it just may be a little more expensive to undergo. Once you’ve worked out which type of loft is in your home, whip out the measuring tape, it’s time to get down to business. In order to find out whether converting your loft is a possibility, there are two main aspects to consider. Although this is just a general guideline, your loft’s internal walls should expand across 7.5 metres from front to back, and 5.5 metres from side to side. However, as is mentioned, this is just the ideal space - smaller lofts are possible to work with. Ideally, the pitch should be at a higher angle, so that the central head height is the highest possible. Any angle above 30 degrees would work best. In order for your proposed loft conversion to pass building regulations, it must measure 2.2 metres from the floor to the highest point. This allows for sufficient head height, while at the same time taking into account that the roof has to be insulated and the floor built up. Another deciding factor will be access to the loft - do you have enough room to erect a staircase on your first floor? This is something your architect will be able to advise on. Under your permitted development rights, as a homeowner you are allowed to extend your roof space by up to 50 m3, or 40 m3 for terraced houses. However, there are certain specifications, so you must plan accordingly, otherwise it will be counted as a project that requires planning approval. It’s worth adding that these permitted development rights do not always apply for homes in conservation areas - consult with an architect or planning officer to see if planning permission is needed. If you’re thinking of undergoing a loft conversion, our Resi architects can ensure that you stay within your permitted development rights, or even secure planning permission. Speak to one of our experts to find out how we can help. Building regulations are a set of guidelines the homeowner must follow in order to be approved, concerning fire safety, energy efficiency, household fuel conservation, and many other similar topics. Every loft conversion requires building regulations approval, regardless of whether planning permission is involved or not. Another thing to keep in mind is that, if you’re in a terraced or semi-detached home, you will need to consider the party wall you’re sharing with your neighbours. If modifying a shared wall, building, or boundary, you will need to get consent from the other party. We recommend notifying them early on in the process, in order to avoid any awkward and costly disputes. Believe it or not, a loft conversion in a flat is not completely out of the question. In order to do so, you will need to own the freehold for both the flat AND the loft space. Plus, you will need to make sure you have a party wall agreement signed with those living below and next to you. For an average sized home, a standard loft conversion will take roughly as little as 6-8 weeks to complete the construction process. So, why not give it a go? If you’re thinking of going forward with converting your loft, why not book a free consultation call and speak to one of our expert advisers today. Architect drawings for loft conversion: why do you need them?